GEO AIP-2 Drafting a Plan for AIP-2 Test and Demonstration January 2009. 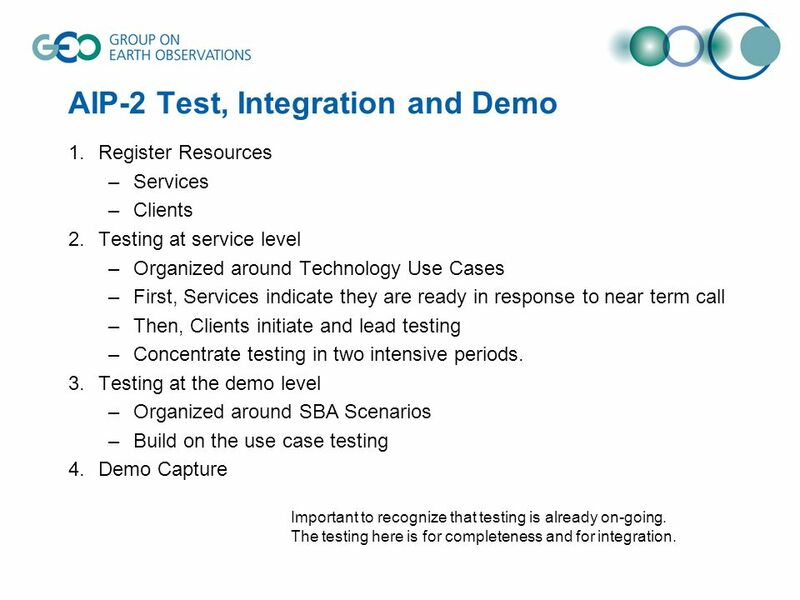 3 AIP-2 Test, Integration and Demo 1.Register Resources –Services –Clients 2.Testing at service level –Organized around Technology Use Cases –First, Services indicate they are ready in response to near term call –Then, Clients initiate and lead testing –Concentrate testing in two intensive periods. 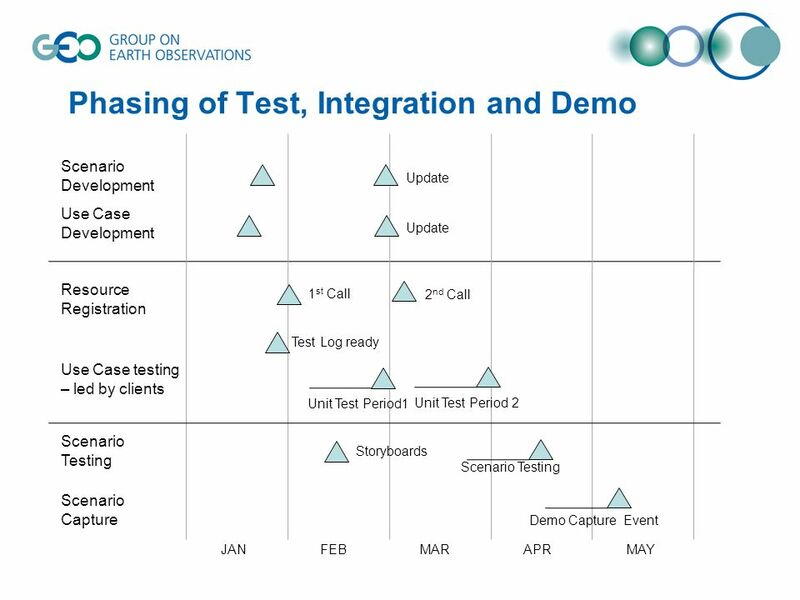 3.Testing at the demo level –Organized around SBA Scenarios –Build on the use case testing 4.Demo Capture Important to recognize that testing is already on-going. The testing here is for completeness and for integration. 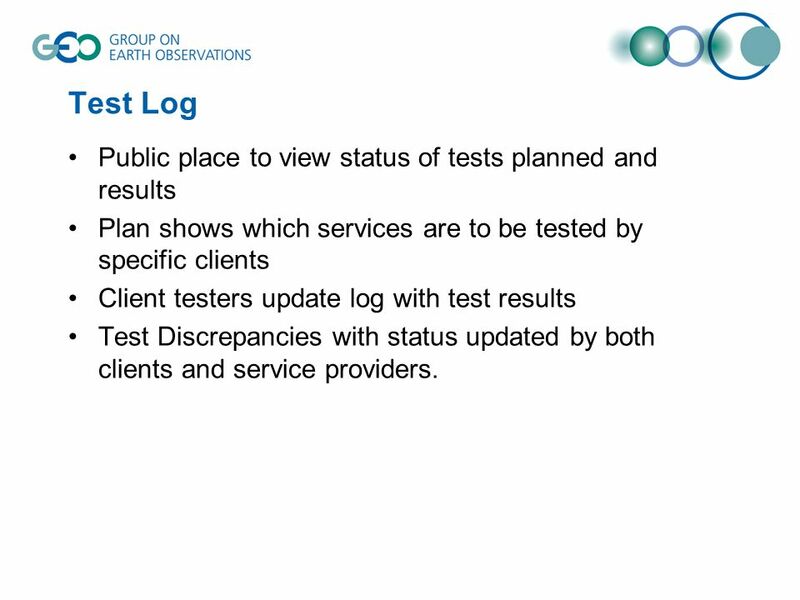 5 Test Log Public place to view status of tests planned and results Plan shows which services are to be tested by specific clients Client testers update log with test results Test Discrepancies with status updated by both clients and service providers. 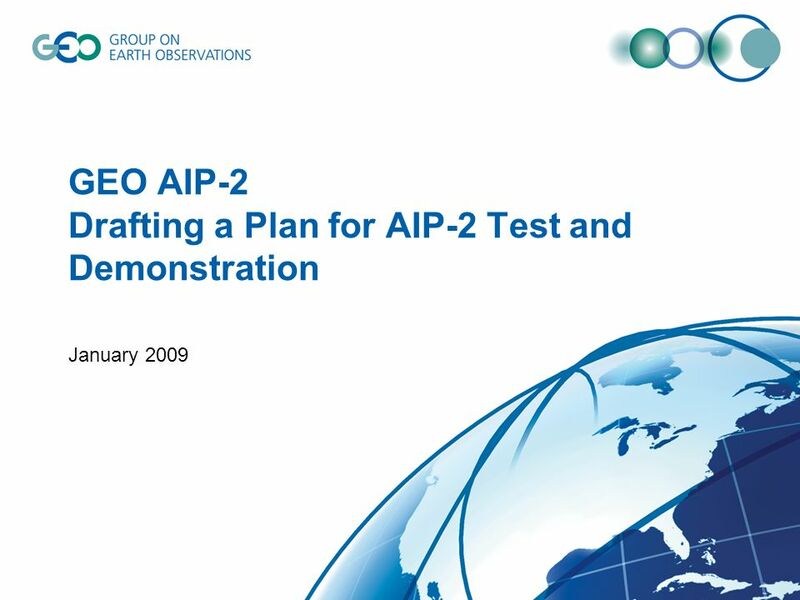 Download ppt "GEO AIP-2 Drafting a Plan for AIP-2 Test and Demonstration January 2009." AIP-2 Demo Capture Workshop 4/5 May 2009 The Palazzo dei Congressi di Stresa Stresa, Italy. GEO AIP-2 Interim Design Review Test Facility Working Group Mauro Semerano (ElsagDatamat spa) ESA December 2008. AIP-5 Demo Capture Guidelines. Demonstration of Advances Topics –Scenarios and non-scenario demos are encouraged (roughly a demo per WG, regardless if. AIP-6 Demo Capture Guidelines. Demonstration of Advances Topics –Scenarios and non-scenario demos are encouraged (roughly a demo per WG, regardless if. GEO Task AR AIP-2 Kickoff Workshop Mid-term plenary NCAR Mesa Laboratory September 2008. AIP-2 Kickoff Workshop Energy SBA Session Ellsworth LeDrew, University of Waterloo, Canada Thierry Ranchin, Mines ParisTech, France GEOSS AIP-2 Kickoff. GEOSS Architecture Implementation Pilot, Phase 3 - Call for Participation - George Percivall, Open Geospatial Consortium GEO Task AR-09-01b Task POC December. GEOSS Architecture Implementation Pilot Water Information Services with GEOSS Interoperability Arrangements George Percivall Open Geospatial Consortium. 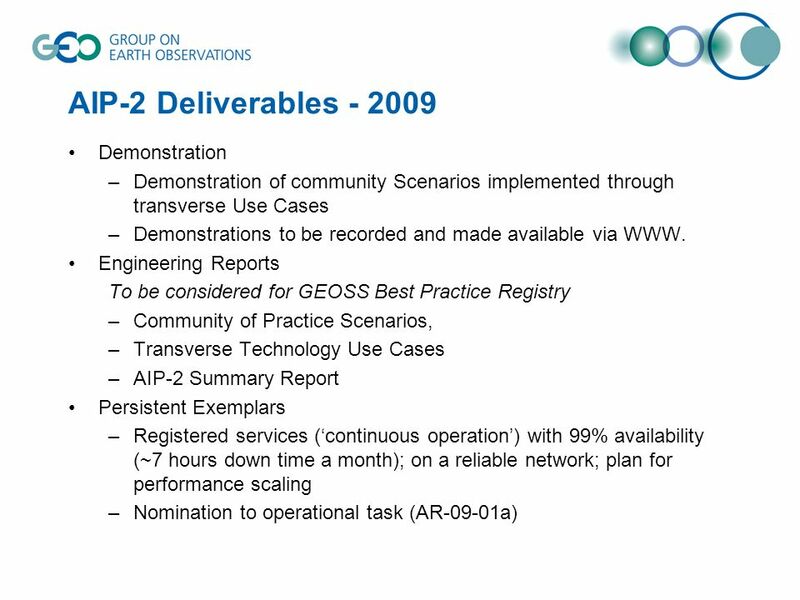 High level summary and recommendations from AIP-3 George Percivall Open Geospatial Consortium Task lead AR-09-01B ADC-16, May 2011. GEO Task IN-05 GEOSS Design and Interoperability Steve Browdy, IN-05 C1 Component Lead George Percivall, IN-05 Task Facilitator GEO IIB Prep Meeting January. Successful Implementations for SBAs using GEOSS Interoperability Arrangements George Percivall The Open Geospatial Consortium Jay Pearlman, IEEE Nadine. GEOSS Task AR-09-01b Architecture Implementation Pilot Phase 4 (AIP-4) Nadine Alameh, George Percivall, Ingo Simonis Open Geospatial Consortium (OGC) GEOSS. Natural Disaster Management Project Pakorn Apaphant/Hiromichi Fukui Project and Application Subgroup Proposed to WGISS 23 Hanoi, Vietnam May 21-25, 2007. AR – Issues for Attention Tactical and Strategic Guidance documents – what is the agreed approval/ publication process? –Strategic Guidance will. GEO Work Plan Symposium 2011 Days 2 & 3 ID-01 Data Sharing. Standards and Interoperability Forum: Status, Issues & Plans GEO Architecture and Data Committee Kyoto, Japan 9 February 2009 Siri-Jodha Singh Khalsa. Training for rotavirus vaccine introduction Module 5 Recording and monitoring uptake of rotavirus vaccine.